Overall the month of July 2014 has been fraught with new malware campaigns against various entities and this has been the trending since approximately 2010. Malware today is the pivot point for attacks and these campaigns are initiated with emails (phishing) as well as other attacks. The Facebook cross site scripting attack that engages the user to go out of their way to compromise themselves is indicative of where the trend is going and shows how important user education is to malware prevention. As the adversaries grow in number and become more sophisticated in their practices (i.e. crimeware taking on more APT like characteristics) and the re-use of domains between actors it is increasingly apparent that the front line is not only technologies like SIEM and AntiVirus, but also the end users themselves. Additionally, as the activities of nation state actors continue so too do the operations by hacktivists like SEA (Syrian Electronic Army) and countless other individuals and collectives that will use the same tactics and tools as well. Suffice to say that this is not going away soon and in fact will instead increase geometrically as various countries become more wired across the globe and allow for easy access to the net for these activities. This report is a generalist approach to data that has been in the news cycle within the month of July 2014 but deliberately selected to give a melange of stories that should be considered by any CSO, CISO, or others within domains trying to protect their assets. This is not directed data however, and this is an important part of the intelligence cycle that must be taken into account when reporting to executives. Thus I have placed this report in .odt form on this page for you to download and to add data for your own environment to use in enlightening your staff as to your own metrics on attacks and other activities that affect you directly. Approximately 92 per cent of respondents believe that the use of a social networking site increases the likelihood of a successful APT attack, which could prove a threat to a large proportion of businesses. 88 per cent think that ‘bring your own device’ combines with rooting or jail breaking by the owner make a successful APT attack more likely. Over two thirds of people think that it is only a matter of time before their enterprise is targeted. However, despite this, the majority of respondents believe that they are prepared to detect, respond to and stop an APT attack. The most common technical control used to protect against these are antivirus and anti-malware, which over 90 percent reported using. This was followed by network technologies such as firewalls, then network segregation. Under 30 per cent reported using anti-malware controls on mobile devices. Around 96 per cent of the respondents are somewhat familiar of what an APT is, which is more than was reported last year. They define an APT as an adversary that “possesses sophisticated levels of expertise and significant resources which allow it to create opportunities to achieve its objective by using multiple attack vendors”. This could come in a variety of formats, and some suggest that it is geared towards the aim of political espionage. “They often use the same attack vectors that traditional threats leverage, but they also leverage different attack methodologies and have different characteristics than traditional threats,” the report said. APT attacks are not arcane and solely targeting Defense Base corporations. While APT activities have been in the news it is still important to note that not everyone knows what an APT is never mind how they operate. Many still do not consider APT a threat because they have the perception that their environments are not of importance to the Chinese and others. This is a misapprehension that must be corrected. There is always the possibility that your environment may be a target for data that you hold or access that you have leading to another target more sought after. It is important that more within the field of security understand how APT works and separate the hype from the reality. Anonymous announced last month that they would be attacking Israeli systems to protest their attacks in Gaza and the troubles ongoing in the area. This stemmed from the abduction and beating of youths in the area that now have blown up into all out missile wars between Hamas/Palestine and Israel. The hackers managed to deface many government pages as well as leak user names and passwords to systems. Overall this type of activity is questionable as to its merit for or against war. In the grander scope of things these attacks do not stop the hostilities between parties or ameliorate much else other than the sense of accomplishment on the part of the Anon’s out there taking part in it all. The flip side of this is that any action against a corporation of government that is successful will lead to financial loss as well as perceptions of vulnerability for said company or government systems. This is the essence of asymmetric warfare. In 2010 the NSA, CIA, FBI, and other agencies learned that the NASDAQ Stock Exchange had been hacked by a Russian individual and malware was placed within their core servers. The malware was a form of logic bomb that could potentially stop trading on Wall Street and thus cause a cascade effect in the global economy. This incursion into the NASDAQ network shows how one actor can potentially have a mass effect on the local (US) and global economy should his attacks have been carried out. The malware was designed to erase data and lock users out of systems. This would have had a detrimental effect not only in downtime but also in confidence in the stock exchange as well as the economy in general. These types of “Supply Chain” and FInancial attacks will be on the uptick in the future as adversaries work toward global implications of their actions as well as Nation State actors like China who foresee these types of attacks as a necessary tool within the 5th domain. Microsoft moved to take down the NO-IP dynamic Domain system in an effort to short circuit cybercriminal and APT activities. The service allowed for quick and anonymous creation of dynamic domains that these actors would use as command and control servers for malware. This particular takedown affected a great number of malware systems. This takedown shows the ecology of many of the malware campaigns out there today. They tend to use the same C&C infrastructures that Crimeware inhabits and thus at times it can be hard to determine who the actors truly are. In the case of the Flame and MiniFlame servers this action will be taking out a significant amount of APT activity which may in fact be Israeli in origin. As the actors become more adept at their prosecution of warfare in cyberspace so too will the disinformation and psychological warfare capabilities and actions increase. As a means of knocking out large swaths of C&C Microsoft is taking more solid action by taking the systems down as opposed to watching them as others might do. This is an ongoing discussion within the community as to whether it is better to just remove their access rather than watch them and use that information later within intelligence circles. 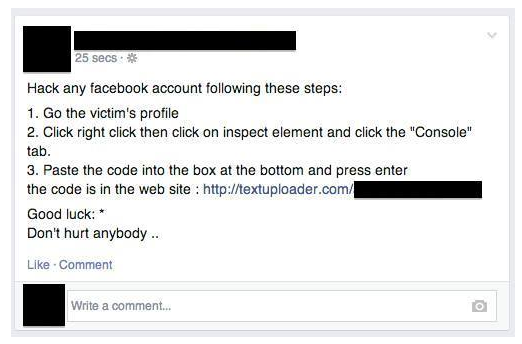 This attack leverages user’s interest in hacking into “anyone’s” Facebook account. The gist of this attack is the task of fooling the user to input code into their browser that will then exploit the end users account and allow access to it by the attacker. This exploit works on a premise based in social engineering and psychology. Humans have a penchant for wanting to know unknown things or to be slightly “bad” and thus this attack works. By fooling users into exploiting their own accounts this attack falls more within the social engineering area than anything else. The core problem is that Android fails to validate public key infrastructure certificate chains for app digital signatures. According to Google’s documentation, Android applications must be signed in order to be installed on the OS, but the digital certificate used to sign them does not need to be issued by a digital certificate authority. The analysis of this vulnerability is that no system or hardware should be considered to be absolutely “secure” The reason for this is not only that there may be inherent flaws in the systems creation and upkeep but also from end user abuses or misconfiguration. Secondarily, if you run a BYOD program then Android may be more vulnerable to attack than you may have thought previously. Even with software means to protect your data the system itself could be compromised due to the way it was created. 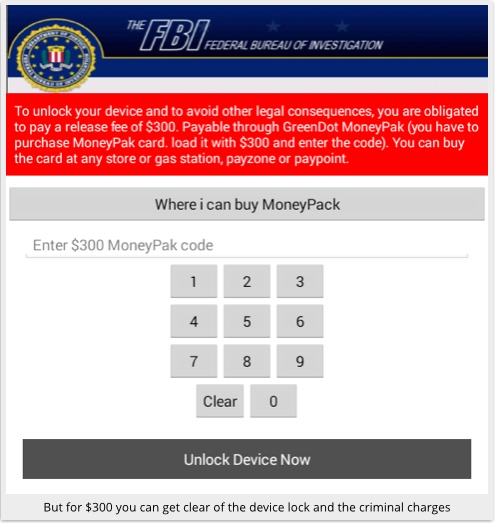 This malware is tricky in that it ostensibly offers something that Android does not have now (i.e. access to Flash) so this tricks many people into installing it in the first place. The malware then takes over the phone and is hard to get rid of. The final analysis though is that these types of malware and extortion schemes are becoming more commonplace and thus end users should be more aware of these tactics and how to deal with them. In the case of this malware the payment scheme does not mean that they will be able to rid themselves of the malware. 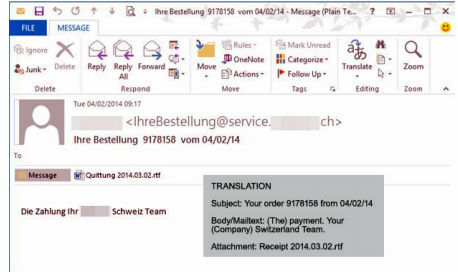 Operation Emmental attacks are spread using phishing emails which masquerade as being sent from a reputed online retailers. These emails contain malware-infested links which users are prompted to click. If victims click on the link, the malware gets downloaded to users’ computers/mobile devices. This malware creates in effect, a “Man in the Middle” attack and then tricks users into thinking they have a secure session with their site of choice. This attack is even more dangerous because it cleans up after itself and is hard to detect until it’s too late. The upshot here is that end users should be aware of how to check links in emails before clicking on them and be aware of phishing attacks through regular security education. It seems that the Nigerians have learned that their tactics are losing ground and they have to move on to bigger and better things. It stands to reason that as things become more point and click and the media gives attention to the big losses by malware at large corporations that the 419’ers will get in the game as well. I expect that the phishing emails will have the same tell tale flaws but people will still click on them and infect their machines with malware. All in all this is just another player in a saturated vector that we all need to pay attention to. Be on the lookout for the usual types of emails but instead of asking for someone to wire something those will instead be links to malware. As these guys get more savvy we all will need to keep an eye out for their phishing emails. On a threat scale these guys aren’t high just yet. Historically the Nigerian scammers have been using emails and phone calls to steal money from unsuspecting people. Recently though they have moved into the world of phishing and hacking using phish emails to send people malware. Once the malware has been installed the 419 scammers are acting just like other criminal actors and stealing personal data and passwords. These they then use to steal money or create fake identities for their own purposes. The 419 scammers are finally getting into the modern world of malware because people have been catching on to their usual routines as well as spam filters are stopping their emails. The scammers then had to change their tactics in order to continue their work and their revenue streams. This is a natural evolution really but it shows just how effective these tactics are and how easily they can be picked up by people like these. Financial and business information was stolen from several shipping and logistics firms by sophisticated malware hiding in inventory scanners manufactured by a Chinese company. The supply chain attack, dubbed “Zombie Zero,” was identified by security researchers from TrapX, a cybersecurity firm in San Mateo, California, who wrote about it in a report released Thursday. This is what is known as a “supply chain attack” and it means that an attacker has managed to attack your supply chain either by stopping it or changing its capacity in some way. These attacks can be devastating to a company where time and flow of product is essential to the business operations. This also can be seen in the light of supply chains such as military and other chains that could be broken to affect warfare in the favor of an attacker. This malware is novel in a couple of important ways. First off it is on UNIX using a common vulnerability and secondly it is a botnet that is also leveraging those systems infected to compromise other systems. UNIX and Linux are the underpinnings of the internet so if this malware infects systems as rapidly as predicted this could be a real juggernaut. It is recommended that all UNIX systems facing the internet should be looked at and assessed for the vulnerability that allows for this malware to load and add the systems to the botnet. A phishing attack was launched on 7/21/2014 that leveraged a new 0day and had a very short window of opportunity. The attack has been dubbed Pirpi or Gothic Panda (by Crowdstrike) and is now over. Detection of the attack was quick and the duration of the emails and the hacking was approximately three days. Our records show that you have an outstanding balance dating back to January. Your January invoice was for $445.00 and we have yet to receive this payment. Please find a copy of the invoice enclosed. If this amount has already been paid, please disregard this notice,and let us know that in this link. Otherwise, please forward us the amount owed in full by Aguest 1st. As our contract indicates, we begin charging 5% interest for any outstanding balances after 30 days. The links led to resources at hazarhaliyikama[.]com. All emails linked to this domain with a pseudo-random URL paths just like the earlier spam runs from late April. Each recipient was given a unique URI. Examples below…. A “highly sophisticated Chinese state-sponsored actor” recently managed to hack into the computer systems at Canada’s National Research Council, according to Canada’s chief information officer, Corinne Charette. The attack was discovered by Communications Security Establishment Canada. In a statement released Tuesday, Charette, confirmed that while the NRC’s computers operate outside those of the government of Canada as a whole, the council’s IT system has been “isolated” to ensure no other departments are compromised. Chinese APT (2PLA People’s Liberation Army) has been active for some time now attacking defense base and other companies. However, of late they have changed tactics and added think tanks and other governmental bodies that suit their intelligence needs. In the case of the Canadian NRC (National Research Council) China seems to be looking for intelligence concerning matters of state with regard to Canada. This is an important pivot and shows that no group is beyond the interest of the Chinese state. Hacker outfit the Syrian Electronic Army (SEA cracked the Israel’s Defence Forces (IDF) Twitter account where it posted a fake warning of a possible nuclear leak due to rocket strikes. The group posted under the IDF (@IDFSpokesperson) account of a “possible nuclear leak in the region after two rockets hit [the] Dimona nuclear facility” which triggered a brief panic among some of the account’s 215,000 followers. The SEA published a screenshot showing it gained access to the IDF’s Hootsuite dashboard, a Twitter client that manages public tweets and private direct messages. Israel’s defense force later apologized for the erroneous and alarmist tweet advising users it was compromised and would “combat terror on all fronts including the cyber dimension”. The importance of attacks like these is the use of disinformation and the open forum of Twitter. In this case it was a panic after such news (disinfo) was placed on the account’s timeline. However, in another case last year the same actors placed information that the White-house had been attacked and that President Obama had been hurt. Once that news had been placed on the Twitter stream the stock market went down and panic ensued. These types of attacks can be powerful against companies as well and could cause financial and reputational loss. It is thus important to consider social media accounts as needing extra security attention as they can be breached and misused in these ways.